P. terribilis originates from Columbia. The terribilis is a larger frog that does well in groups. 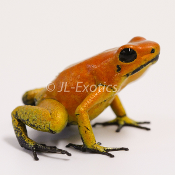 The terribilis is also a bold and colorful frog with a beautiful call. They are aggressive feeders and will tackle prey much larger than the typical dart frog (anything they can physically subdue in fact!). The story of the P. terribilis is a fascninating one... and at this time there is still much that is unknown. Until recently, it was thought that the native habitat for P. terribilis was limited to a small tract of suitable land less than 10 square miles in size located on the western coast of Colombia in the western foothills of the Andes on a “northerly inclined spur of the Cordillera Occidental”. The terrain is rough and hilly, with mostly steep, even perpendicular slopes. Elevation in their range varies from 90-200 m above sea level. They live in rainforest, occurring throughout the forest both on drier ridge tops and on moister slopes. They tend to live near smaller streams since forest along the larger streams has either been cleared for agriculture or is dense secondary growth forest (Myers et al. 1978). Recently, however, it has been confirmed that the range of the P. terribilis is much larger, perhaps 10 to 20 times larger (i.e. 100 - 200 sq. miles). Unfortunately, the area inhabited by P. terribilis is quite remote and the landscape is littered with coca plantations. In addition, the presence of FARC and armed conflicts make the area unsafe for a more detailed survey. Because of this new information, the Tesoros de Colombia frogs should be kept separately from the other P. terribilis currently found in US collections. There has long been a belief within the US hobby that the P. terribilis is subject to an extreme sensitivity to temperatures above 80F. This rumor has persisted to the point of becoming undisputed folklore. We at JL-Exotics have long wondered about this temperature sensitivity and found it odd given the climate and elevation where they naturally occur. In fact, our suspicions were valid! Our direct communications with the Tesoros de Colombia Sustainable Farm confirm that P. terribilis can not only thrive at temperatures ranging up to 86F, they can be seen sunning themselves at those temperatures too. Given this information, we believe we have debunked the temperature sensitivity myth that still persists in the US hobby today. We suspect that the observations that led to this dogma may have been overstated or the actual high temperatures may have been significantly under estimated. It is also possible that the temperature change was sudden enough to induce shock to the affected animals. Now, this is not to say the JL-Exotics advocates keeping P. terribilis at temperatures above 80F at all times. We only wish to share some of the knowledge that we have gained from our friends in Colombia. Thank you to Tesoros de Colombia Sustainable Farm for offering your insights! For those hobbyists that wish to support amphibian conservation - Tesoros de Colombia is the only sustainable farm in operation in Colombia exporting legal Colombian frogs for the pet trade. They are also involved in active conservation through education programs, land purchase and reclamation, and even species reintroduction for the re-establishment of extant species displaced by habit destruction, pesticides, chytrid, or over collection (i.e. smuggling) for the pet trade. By supporting Tesoros de Colombia you are helping to destabilize the smuggling of illegally collected and exported animals - most of which die needlessly before ever leaving the country. Frogs offered are captive bred, unsexed and approximately 4-10 months or older. PLEASE NOTE: Priority Overnight Shipping is required for all Animal Purchases. Additional items will be shipped seperately via USPS ground or similar.